Have you ever saw someone taking a different approach – something you yourself would never do- and scratched your head thinking, what on earth, how does that work, WHY? Like someone who is into extreme sports, or a particular diet, or religion. They might be someone you really love or admire or respect, yet you can’t imagine spending your time or focus doing that they chose to do. While I was studying at the Institute for Integrative Nutrition, we learned about the concept of bio-individuality, which is the now scientifically proven theory that no one diet or nutritional approach works for everyone. So how did it come to be that there is only one prescribed approach to problems with alcohol? Before 1935, there was very little in the way of support or study of both the brain and effective addictions treatment. When Alcoholics Anonymous was established that year, it filled a void. The seemingly simply approach it offered – lifelong abstinence from alcohol – combined with a prescribed step-by-step program, quickly became the go-to approach. However, due to the tenets of anonymity and lack of records kept by the amorphous groups, its efficacy has never been properly studied. Yet AA and the offshoot 12 step programs who claim that one drink might as well equal 100 and peg relapse as a personal failure are the norm. The proliferation of these community-based groups has absolved governments of having to fund and provide evidence-based treatment options. There is no denying this approach has worked for some who have dedicated their lives to it (including close friends and family members of mine). I am not challenging that it can work for those who work it (one of the AA slogans). However, according to a study by the Centre for Disease Control and Prevention, nine out of 10 heavy drinkers are NOT dependent on alcohol and, with the help of a medical professional’s brief intervention, can change unhealthy drinking habits. Don’t you think it’s high time for other approaches that honour our bio-individuality, our unique histories, and desires for the future, our different personalities, our intuition? Which is why I am introducing an alternative…. 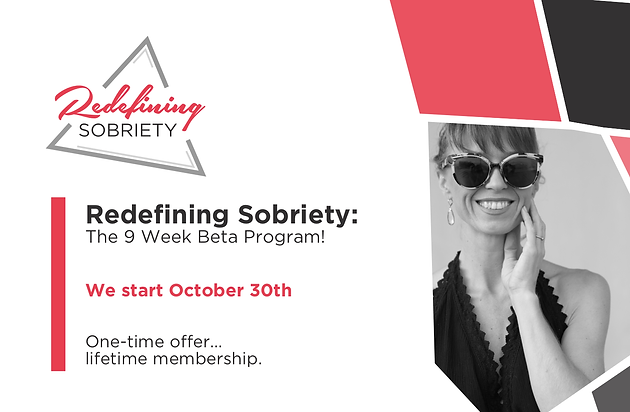 Let me present you with: Redefining Sobriety! This is not a band-aid or a quick fix. It is not a prescription, or a one-size fits all model. You CREATE your vision, you OWN your story, you DECIDE your path. If you have been a private client, purchased the Drink Less Be More Masterclass, or are a current Be More member, you can join now and receive a LIFETIME membership for 50% off, that’s $113. Whaaaaat? I know. But I love you and appreciate everything we’ve done together. And I would love nothing more than for you to join me in this next phase of the journey. Just click here. There are very limited spots available in this super special beta group (with the lifetime membership bonus). Six are already spoken for – is one of the remaining spots yours?